Good Monday morning. It’s November 26th. #GivingTuesday is tomorrow. We’re supporting SPARC, a Virginia organization that helps adult with disabilities, and we’re asking you to do the same. Thank you in advance for being generous. Today’s Spotlight takes about 3 minutes to read. Facebook tried a news dump the day before Thanksgiving, but had even more problems as the week went on, especially in London. More than 500,000 people downloaded malware posing as racing games from the Google Play store. Get details here. YouTube is now offering ad-supported full length movies for no additional fee. Congratulations to YouTube’s parent company, Alphabet, for reinventing broadcast television. Choose wisely: do you think a social media network that allows people to play Farmville can triumph over a legislative body that has helped govern a country for 803 years? The Serjeant-at-Arms of the House of Commons escorted a Facebook contractor to Parliament last week. The businessman was advised that he was subject to fines and imprisonment if he failed to surrender documents related to how Facebook handles user data. He complied with the order, and Facebook is unhappy. Among their arguments falling on deaf ears was a California court order sealing those records. 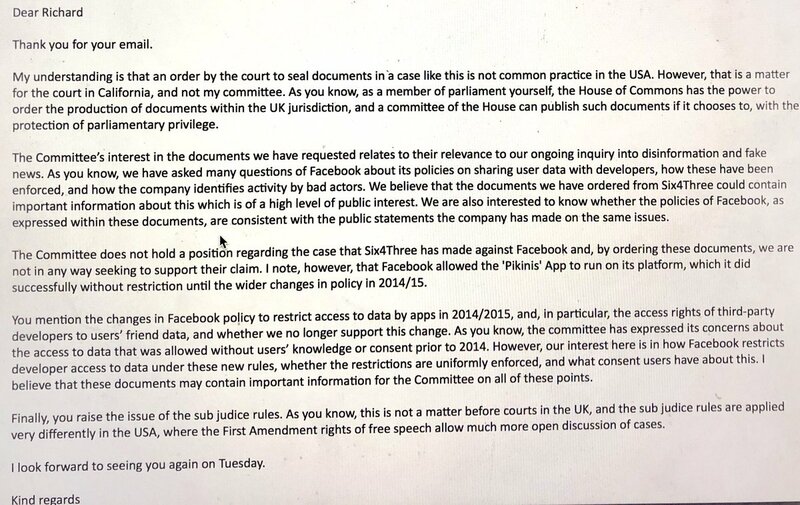 MP Damian Collins released the text of a message to Facebook VP Richard Allan, who is due to testify in Europe tomorrow. You can read Collins’ message here. This is still fallout from the Cambridge Analytica scandal that was made public earlier this year. Another current scandal that is still developing relates to Facebook hiring a public relations firm that used normal but ethically questionable techniques to smear Facebook competitors and critics. Facebook released a message from an outgoing exec on Wednesday that was apparently intended to provide cover for #2 exec Sheryl Sandberg. Recode has an excellent explainer about this latest scandal. Amazon continues disrupting retail markets. Whiskey is the latest as it sells an exclusive 19-year-old Bowmore single malt. “Amazon has decided to compete against us” are words you don’t want to tell your Board. Oh, and advertising. It’s selling an awful lot of advertising. Not Google-levels yet, but give them time. And because Internet users band together for really nice things, here is the story of two college-aged women reunited after they were friends on a cruise their families took 12 years ago. Story at Elite Daily.